The baseball card market was again dominated by Topps in 1958 as they were the only major card brand that was available to MLB collectors nationwide. Topps continued to tinker with the layout and they also listened to fans by including more cards of popular players and more cards overall. Smaller regional releases also enjoyed popularity and those sets offer rare non-Topps alternatives for several Hall of Famers. In the list that follows, the top baseball cards singles of 1958 are collected, including some of the most valuable cards of the era. Growing by more than 20% from the previous year, 1958 Topps expanded from 407 to 495 cards. In actuality, only 494 cards were issued as Philadelphia Phillies first baseman Ed Bouchee was banned from baseball after being convicted of indecent exposure, and Topps never released his card (#145). Shop for Professionally Graded 1958 cards on eBay. Topps incorporated several changes into the flagship set including expanding the number of multi-player cards and, for the first time, adding cards devoted to members of the All-Star team from both leagues. Those All-Star cards were featured at the very end of the release with cards #475 to #495. Also making their debut, checklists were worked into the set itself as they were found on the back of the team cards. Beyond all the new additions, the first series of '58 Topps offers more to chase as color variations for the team name on several cards included some printed in white and some in yellow lettering. Collectors have placed a premium on the yellow text, creating high-priced variations for key players (some which also make this list). Another set that goes hand-in-hand with 1958 Topps is the 1958 Bazooka Patches. Bazooka gum, also created by Topps, was a staple in each pack and the 1958 set featured an insert offer card for a felt patch of your favorite team. Each major league team was available and the patch had "My Favorite Team" printed over the logo. The patch for the "new" Los Angeles Dodgers has proven to be the most valuable. There were also several regional sets found in 1958 and many were food-based releases. Kahn's Wieners featured members of the Pittsburgh Pirates and Cincinnati Reds with, most notably, cards for Roberto Clemente and Frank Robinson. Bell Brand Chips issued a set of cards with a unique design to celebrate the Dodgers' first season in California. The cards showcase sepia photographs in a wood-grain frame and the top cards in the set honor Roy Campanella and Sandy Koufax. Other 1958 products of note include Carling Beer, who again released a Cleveland Indians set with their Carling Black Label Beer. Also, Hires Root Beer issued a book on how to play baseball along with their 66-card set, and electronics manufacturer Packard Bell produced a seven-card series in honor of the Giants and Dodgers moving to California. The key Packard Bell cards include Willie Mays and Gil Hodges. While many of the 1950s Topps sets from the early part of the decade are famous for having remarkable rookie card classes, 1958 Topps features just one Hall of Fame rookie in San Francisco Giants slugger Orlando Cepeda. 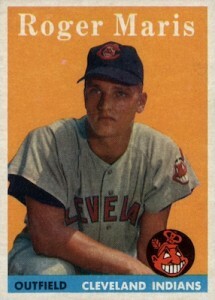 However, the most popular rookie in the set belongs to Roger Maris, who was with the Cleveland Indians at the time. 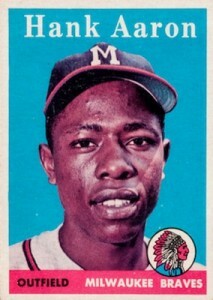 Other notable or fan favorite rookie cards include Curt Flood, Milt Pappas, John Roseboro, and Woody Held. Along with the cards featured below, there are several other cards from 1958 Topps that are worth pointing out. Al Kaline's card from the first series has the yellow and white variations, making it popular with collectors. Two Yankees cards, Yogi Berra's card (#370) and the Yankees team photo card (#246), remain very popular with fans of the Bronx bombers. Also, two combo cards, "Rival Fence Busters" featuring Willie Mays and Duke Snider, and "Sluggers Supreme" with Ted Williams and Ted Kluszewski, are highlights of Topps' expanded use of the combination cards. Dealing strictly in terms of value, one of the best cards created in 1958 is actually an error card. Philadelphia Phillies pitcher Pancho Herrera's base card (#433) can normally be purchased for just a few of dollars but a rare error variation that features his last name spelled without the final "a" commands thousands at auction. 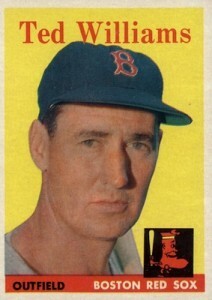 Given the limited nature of baseball card products that were available nationally in 1958, each of the cards included on the list originate from the main Topps set. The set is always in high demand with collectors and the quantity of cards available is by far the most of any product made during the year. Card value is the key component in placing cards on the list, along with the historical importance to the hobby. The first of two rookie cards is Orlando Cepeda's earliest Topps release which features him covering first base on a field of bright orange. 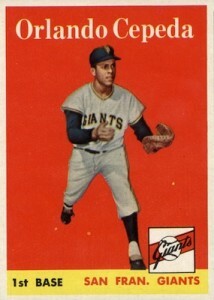 Cepeda would start his career strongly as the NL Rookie of the Year in 1958. The only member of Cooperstown with a rookie card in 1958 Topps, this Cepeda card offers great value to collectors looking to build a Hall of Fame rookie set. Later in his career, he would become the first power-hitting designated hitter and a model for how modern American League teams used the position. 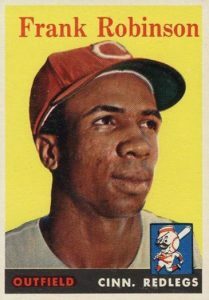 Frank Robinson's rookie card from the previous year debuted high on the 1957 list and his second-year Topps card offers great value to collectors who can't afford his pricey '57 rookie. 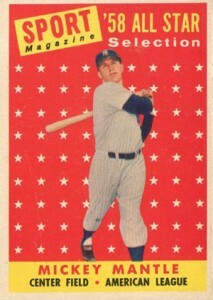 Robinson is also found on an All-Star card as well as a multi-player combination card entitled "Birdie's Young Sluggers" in honor of Red's manager Birdie Tebbetts. Robinson is featured on the combo card along with catcher Ed Bailey as the one-two power punch in the Red's lineup. As you will notice on Robinson's base card below, the Reds continued to be known as the "Red Legs" during this period as to not be confused for supporters of the Communist Party. Just as they did with 1957 Topps, the card maker again placed many of the key stars near the very top of the checklist in the first series and the "Say Hey Kid" sits at card #5. 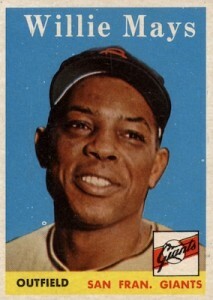 Fans can find three Willie Mays cards (not including the Giants team photo card) in the set and, like a large portion of the product, his card is a close-up portrait in front of a solid-color background. The reverse side of the card details Mays' stellar 1957 in which he became the first player to simultaneously hit 2o or more doubles, triples, and home runs in a single season. While most of the cards on this top list feature close-up portrait photos, Roberto Clemente is posed in his batting stance. 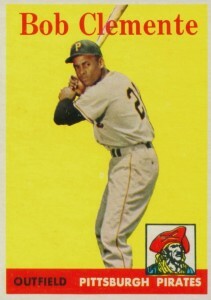 Clemente's name "Roberto" is shortened to "Bob" on the front of the card by Topps as it was in the prior year and it would remain that way through 1970 Topps. Clemente's card is also one of the few early releases on the checklist that has the yellow and white team lettering variation. 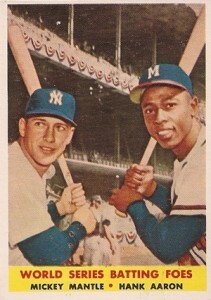 The combination of the two best home run hitters in the American and National League on the same card has made this one of the most popular options in the 1958 set. The "Batting Foes" card is in honor of the 1957 World Series which saw Mickey Mantle's New York Yankees battle Hank Aaron's Milwaukee Braves. The card is framed beautifully with the right-handed Aaron and the switch-hitting Mantle both lining up to swing the bat. Aaron would win the World Series battle and the war as he hit .393 over the series with three home runs and the Braves beat the Yankees in seven games. Nearly all the players on this list were either unquestioned stars or top prospects at the time their 1958 cards were produced, yet Sandy Koufax was only entering his third season in the league with few indications of the elite pitcher he would become. It would be three more years until he won more than 11 games in a season. The amazing conclusion to his career (3 Cy Young Awards and an MVP in his final four seasons) has propped up the value and popularity of his trading cards during those earlier lackluster seasons. For the second year in a row, Ted Williams was given the coveted #1 spot on the Topps checklist and after his remarkable performance during the 1957 season, there was no doubt as to why. Although he was 39, Williams had one of the most productive seasons of his career, batting a league-leading .388 with an amazing 38 home runs. The home run total, as the reverse side of his card tells us, was four more than Mickey Mantle had that season. This card would also prove to be his final Topps player card as Williams teamed with Fleer in 1959 to make an entire set devoted to his remarkable career. Only one rookie card of a non-Hall of Famer would ever be able to reach such a high position on a yearly top list and that special designation is reserved for Roger Maris, the slugger who broke Babe Ruth's infamous single-season home run record. Maris was a Cleveland Indians prospect at the time and, after a good showing during the 1957 season, he was traded to the Kansas City Athletics in 1958. Two seasons and another trade later, he would join the Yankees roster. Alongside teammate Mickey Mantle, the duo would both take aim at Ruth's famous record in 1961, with Maris besting both Ruth and Mantle. The king of the variations available in 1958 Topps is future home run king Hank Aaron as he has both the yellow and white letter variations that appear on the team names of cards in the first series. Aaron also has a version of his card that looks to have been printed using no yellow color, making the famous green background of his card appear to be blue (featured below on the right). The blue version is incredibly rare and nearly impossible to find. 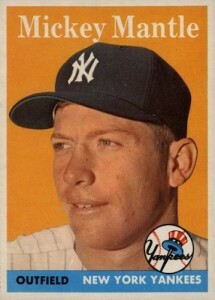 Mickey Mantle again comes out on top with the most valuable and popular trading cards from 1958. 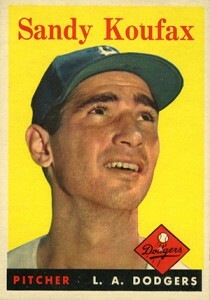 Although his production fell during the 1957 season when compared from his remarkable 1956 performance, he earned the MVP Award for the second consecutive year. Each of Mantle's cards in the 1958 set (he has four of them, including the Yankees team photo card) would serve as an excellent investment as they continue to gain value as time goes by. Mantle's primary base card (#150) is the unquestioned top dog of his appearances and near-mint graded copies can frequently yield $6,000+ at auction. 1958 Topps #307 BROOKS ROBINSON Baltimore Orioles. 2nd Year.